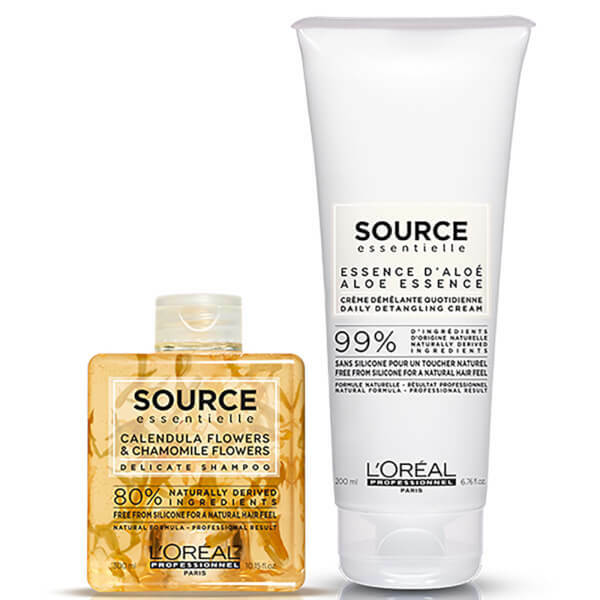 Treat your locks to the L'Oréal Professionnel Source Essentielle Delicate Duo; a soothing shampoo and a detangling cream that work in tandem to cleanse, soften and calm the hair and scalp. 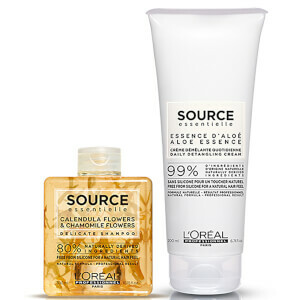 Fortified with a nourishing blend of Calendula and Chamomile Flowers, the daily formula gently eliminates impurities, whilst soothing an itchy scalp and addressing dandruff to help reduce visible flakes. Hair is soft and silky, and the scalp feels calm and comfortable. Infused with a luxurious Citrus and Jasmine fragrance. Shampoo: Aqua / Water, Decyl Glucoside, Cocamidopropyl Betaine, Sodium Cocoyl Isethionate, Sodium Chloride, Glycerin, Sodium Benzoate, Sodium Hydroxide, Caprylyl Glycol, Citric Acid, Hydrogenated Coconut Acid, Salicylic Acid, Gellan Gum, Sodium Isethionate, Linalool, Calendula Officinalis Flower, Benzyl Salicylate, Limonene, Benzyl Alcohol, Maltodextrin, Caramel, Chamomilla Recutita Flower Extract / Matricaria Flower Extract, Parfum / Fragrance (C219790/1).